For big dreams and bigger plans – the Calendar A4 2019 in a gorgeous blue! The deadlines, appointments, ideas and plans are creating a mess in your head? The extra big daily calendar with pink details, golden highlights and a handy spiral binding will help you organize that mess. You will plan your week on a double page with lots of space for notes and can write down all deadlines, anniversaries and birthdays in the monthly and yearly overview. We've also added a monthly recurring project planner for the bigger tasks! 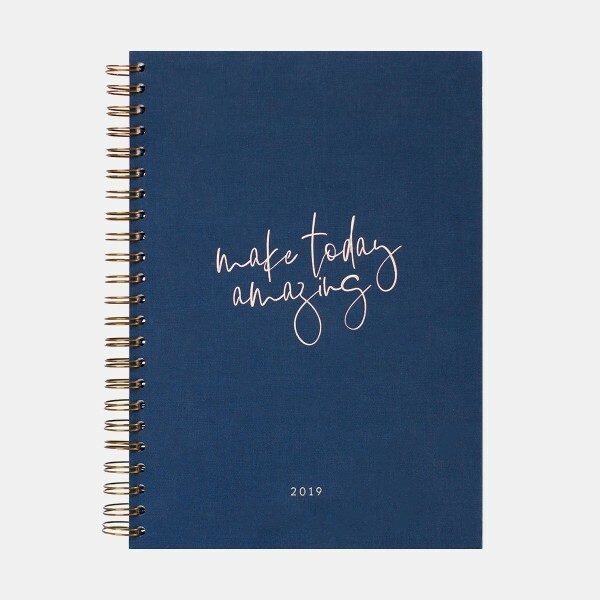 Your plans for 2019 are kept safe by the super robust hardcover with an elegant blue cotton fabric. Weekly Favorite: Notepad A5 "Best Time"